Hubby came home early from the pub Saturday night. He walked in the door, took a wobbly double take at me sitting in the living room, and promptly told me that I’m not allowed to talk to him because he is a ghost. He’s a ghost because usually I wouldn’t have the opportunity to hear his random blather for another two hours, and I’d be asleep by then and avoid it entirely. Somehow being an incorporeal being (instead of just, um, early home) made the most sense to him. The Phantom Of The Opera? Thankfully he doesn’t sing or kidnap sopranos. You could have protested or professed your innocence also, I give up…..ffs! P.p.p.p.p.s – Where’s ya like button gone? Didn’t know it was missing. Just for this post maybe? Hahah. It’s a ghost, too! No clue – this was a draft and I have trouble with those. Damn, good one! Next time! 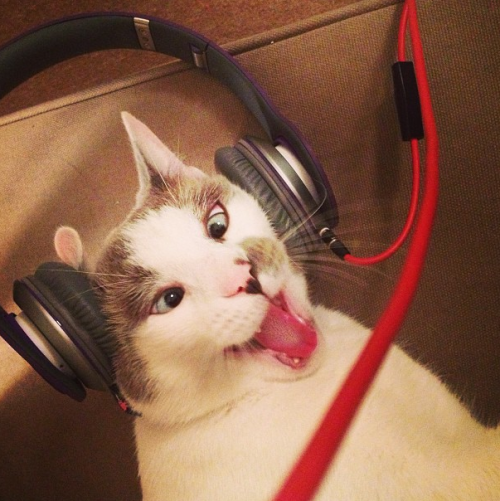 Love the cat with the headphones on. Yours?